Uddingston Cricket Club are midtable in the Western District Premier Division after suffering a 50-run defeat in their latest match on Saturday, writes Michael Clarkson. 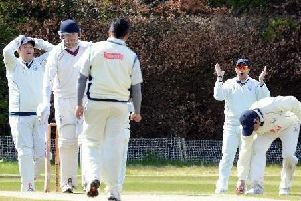 Uddingston Cricket Club are midtable in the Western District Premier Division after suffering a 50-run defeat in their latest match on Saturday. The Villagers lost their home encounter against West of Scotland at Bothwell Castle Policies in the seventh round of league matches played in the 2018 campaign. Winning the toss, captain Greg Watson decided to bat first – he and James Fennah opened the batting. But Watson was out early on after being bowled by Muhammad Adnan, but Fennah and Iain Young pushed the score onto 48. Nicholas Boller and Simon Nailtram added 52 for the fourth wicket before the latter was caught and bowled Ross Lyons for 36. Boller would be fifth out, caught by Uddingston skipper Bryan Clarke off Gavin Bradley’s bowling, and this would be followed by Johnathan Fearn who hit a quick-fire 30. Traver Garwe contributed 24 at the end of the innings, before becoming the third of Muhammad Awais’s four victims, Awis finishing 4/48 from his 10 overs. West finished on 195 all out in exactly 50 overs. The Uddingston reply was delayed for one and a half hours as heavy and thundery rain fell on the Bothwell Castle Policies ground. This also meant that Duckworth-Lewis Sterne was brought into play and a reduced target of 166 from 35 overs was declared from Uddingston. When play was resumed, thunder and lightning could still be seen and heard at the start of the innings. The West bowlers dominated the early exchanges and Uddingston were soon in trouble at 45/4. The top scorer in the first four wickets was Awais who had hit 30 runs before being caught by Fearn off Fennah’s bowling. Sholto-Douglas was then trapped leg before wicket to Garwe for 19, and Ross Lyons was then bowled by Anthony Hullat for 16. When Adil Raza fell for five to Lucas Farndale (who would take 4/18), Uddingston were 83/7. Amir Gul had a brave cameo of 21, but when he was last to fall, Uddingston were 115 all out and West had won by 50 runs (DLS). Uddingston, who have won three of their opening six league matches during this campaign, face a tough looking away fixture at second placed Prestwick this Saturday, June 16.